CES 2012 Make a portable body scanner that can detect 15 diseases and capture key health metrics and you could win 10 million dollars (£.6.5m). This year's X Prize - a global competition with the aim of improving the lot of humanity through invention – asks entrants to make a Star Trek-style "tricorder" that could revolutionise healthcare. Feeling a little poorly, Captain? The device has to be portable, wireless and have a maximum weight of 5lb (2.2kg), explained X Prize Foundation chairman Peter Diamandis, launching this year's challenge at CES. It would have to be able to use sensors to scan, analyse samples and record the vital statistics of the patient. The winning gadget, if anyone manages to produce it, will revolutionise health, Diamandis said. "The competition is designed to address the inefficient, expensive, and inertia-bound healthcare system in the United States and elsewhere," he explained. 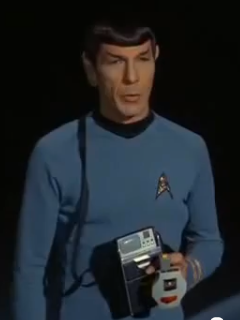 In Star Trek, there were three potential types of tricorders: the medical one, an engineering one and a "standard" tricorder used for scouting out new territory.